November 14, 2017 – I know…it’s hard to really wrap your head around, – fact that the days are shorter, and the nights are colder and wetter. At Olympic, we’re grateful for the fact that this is prime time for hot tubs! If you’re a hot tub owner, have you done what’s needed to prepare your tub for the chilly months ahead? Here are a few things to make sure are in top condition so your tub can take care of you. How are your filters? Your tub’s filters are truly one the parts that get neglected the most. This is not the wisest move, as in many cases they’re directly tied to your tub’s ability to clean your tub (of course) but also to keep it heated! Filters that are too old or too dirty can’t do their job, and it turn can’t take care of you. If your filters are more than a couple of years old, you should consider getting a new set. If you have a Hot Spring Spa that has standard universal filters, consider upgrading to Hot Spring’s proprietary Tri-X filters. They last up to four years, can be cleaned in the dishwasher and give you 65-sq. ft. of cleaning in the same space that a 30-sq. ft. filter normally lives! You’ll love them. And—be sure you’re cleaning your filters monthly. Our new Pleatco Filter Wash Tablets are quick and easy to use with no fuss. How’s your hot tub cover? Ever headed out to the hot tub and wondered who filled your hot tub cover with rocks?! Sometimes they’re so heavy from getting water logged that you’d think that’s the case. Here’s the reality, folks: hot tub covers DO need replaced, ideally every four years. The cover keeps energy costs low, keeps leaves and dirt out, and is hopefully not so heavy you wrench your back taking it off the tub. If your cover is in good shape, use 303 Protectant to help preserve the vinyl and help aid it from allowing water to absorb into the interior. How’s your water? A fresh drain and fill of your tub will help you enjoy crystal clear water to enjoy in the cold months ahead. If you just don’t have the time to do it and you’re in Olympic’s service area, our Valet Team can perform a drain and fill service for you. They’ll deep clean your tub, clean the filters, condition your cover, and get your tub filled and balanced with perfect hot tubbing water. If your tub is in good shape and recently refilled, make sure to keep your alkalinity and pH levels balanced for healthy soaking. 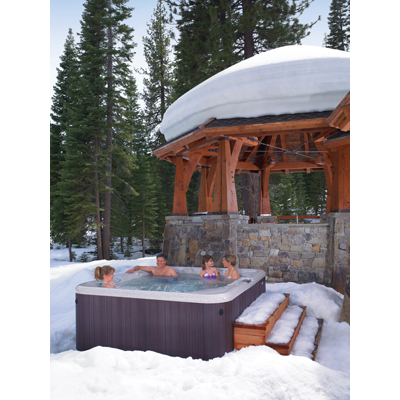 Let your hot tub be your best friend this coming winter! There’s nothing like a great soak in the hot tub to ward off the chilly weather and help you get a restful night’s sleep.